The typical baby boomer couple had $135,000 in retirement savings last year, up from $111,000 in 2013 amid a rising stock market and a strong job market that has kept them employed, according to a report on the new Survey of Consumer Finances (SCF) by the Federal Reserve. Yet $135,000 – the balance for working couples who have a 401(k) – won’t go very far. This amount, held in both their 401(k)s and IRAs, will generate about $600 per month, said the SCF analysis by the Center for Retirement Research, which supports this blog. That’s obviously not enough to supplement most retirees’ primary source of income: their Social Security benefits, which are slowly eroding for various reasons. The purchasing power of the $600 will also be eroded by inflation over time. Another way to assess retirement preparedness for 60-year-olds couples hoping to retire in five years is that they need assets equal to 8.5 times their household income at age 60. They actually have around 2.5 times income, on average, the researchers found. This assumes a replacement rate of 75 percent, a reasonable target for how much of a working couple’s income they will need to maintain their standard of living into retirement. Generation X and millennials, there is time. 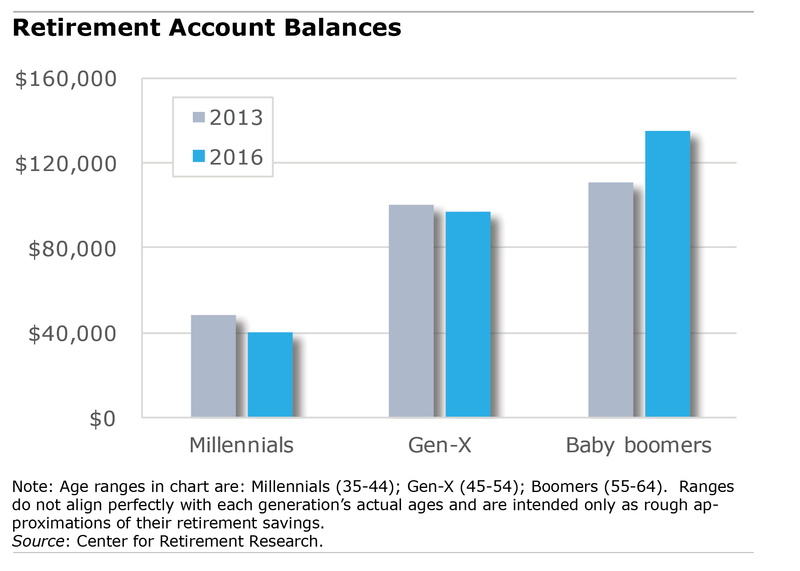 In contrast to baby boomers, who are now mostly too old to rack up appreciable increases in their 401(k)s – though they should try – younger Gen-X and millennials have time and compounding investment returns on their side. This blog examines how they are faring – millennials, because saving and investing well now poises them for a secure retirement, and Gen-X because this “ignored” generation is sandwiched between the financial demands of parenting and parent care. Their own assessments of their retirement preparedness appeared in a recent report by the nonprofit Transamerica Center for Retirement Studies (TCRS). “Millennials have heard the word that they need to save for retirement,” TCRS declared in its report summarizing its 2016 online survey of more than 4,000 workers. Millennials’ ages are up through 37 in this survey. Nearly three out of four who have 401(k)s at work are already saving for retirement. They typically started saving at 22, indicating impressive foresight about retirement dates far in the future. Gen-X, ranging in age from 38 through 51, didn’t get started in earnest until they were 28. While it’s great that millennials are saving for retirement, women in particular are not saving enough, said Catherine Collinson, president of TCRS. Among workers who participate in their employer’s 401(k) or similar plan, the survey finds that the typical millennial woman contributes only 5 percent to her plan, compared with 10 percent for millennial men. Millennials aren’t taking advantage of their uniquely long investment time horizon, the survey finds. Retirement experts encourage younger adults to more aggressively invest 401(k)s in the stock market to enjoy decades of the long-term growth and compounding investment returns and potentially ride out the market’s inevitable volatility. Theoretically, if the stock market’s history proves true, equity-investing millennials can build up substantial retirement accounts, accumulating employers’ contributions and their own contributions and investment earnings over time. But many millennials came of age during the 2008 financial crisis and still seem to be “in a state of shock with their concerns about the stock market,” Collinson said. One in five millennials say they are investing conservatively in bonds, money market funds, and cash. Behavioral economist Richard Thaler, winner of the 2017 Nobel Prize for economics, regards his field’s greatest contribution as showing that people are more likely to save if the saving happens automatically. To make saving for retirement easier, employers have increasingly turned to automated 401(k)s. Automation has taken two basic forms. The first, automatically enrolling each employee, is pervasive and has had notable success in increasing participation in retirement savings plans. The second form, automatically increasing the amount employees save – a concept originated by Thaler and economist Shlomo Benartzi – is catching on. It’s hoped that the second will correct a problem created by the first. Last year, 45 percent of Vanguard’s client base used auto-enrollment plans, according to its “How America Saves 2017” report. Historically, employees were asked to enroll in their employer’s 401(k). 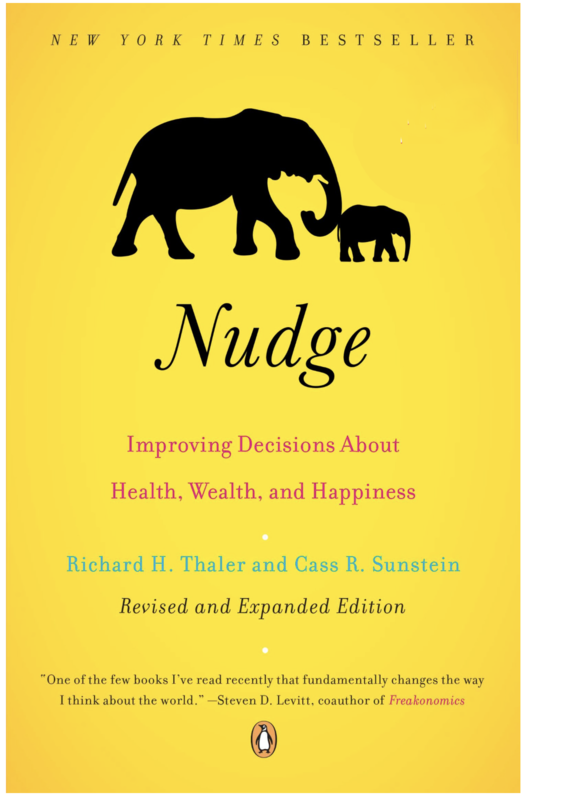 Today, more employers are – as Thaler would say – “nudging” workers by automatic enrolling them, usually when they are hired. Although they then have the freedom to opt out, inertia tends to keep them in the plans. Participation in all types of 401(k)s has roughly increased in lock-step with the spread of auto-enrollment. Last year, 79 percent of workers participated in Vanguard-administered plans, up from 68 percent a decade ago, when a new federal pension law made auto-enrollment more appealing to employers. The first thing that came to mind while listening to a recent webcast about part-time students was, Wow, people like me who attended four-year colleges are clueless about how hard it is to be a part-time student! My second thought was better summed up by one of the webcast’s panelists. Solving part-time students’ immense financial and logistical challenges “is really about economic and social mobility for a large group of citizens in our communities,” said Karen Stout, president of Achieving the Dream, a non-profit network of community colleges that promotes students’ success. Four in 10 U.S. college students are part-time and about four in 10 part-time students drop out very early in their education, according to the Center for American Progress, which hosted the discussion and produced the video above. A new study of Medicare Advantage plans in 20 U.S. counties found that plans with higher premiums generally offer broader networks of physicians to their customers. “There are exceptions but there does seem to be a fairly clear relationship between how much plans are charging and the size of the network,” said Tricia Neuman, a Kaiser senior vice president and one of the study’s authors. The correlation between premiums and network size is one finding in a rare study that tries to get a handle on the quality of Advantage plans around the country amid a scarcity of data on these plans. An earlier Kaiser study looked at how many of a county’s hospitals and top cancer treatment centers are available in Advantage plans. Advantage plans are increasingly popular for good reason: they have lower premiums or offer more extras than enrolling in the traditional fee-for-service Medicare program and purchasing a Medigap supplement and Part D prescription drug policy. They are able to offer lower premiums based, to some extent, on their ability to keep their costs under control, whether this is how much they’re paying to their physicians or to testing labs. But because there is very little data on what Advantage plans pay for medical services, Neuman said that it’s difficult to sort out what is driving the plans’ costs – and, in turn, the premiums customers pay. However, others argue that an insurer’s degree of control over the costs of its medical providers depends on how much market power it has over the physicians it pays for services. The federal Medicare program, for example, has tremendous clout to set prices for medical services, because it controls a large segment of the demand for health care by elderly beneficiaries relative to the supply of physicians and other medical service providers. Research suggests that Advantage plans may partly control their costs by anchoring their payments to Medicare’s payment rates. 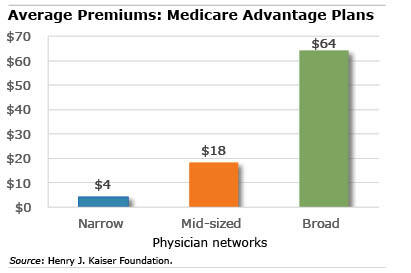 However, narrowing the networks may be another way for Advantage plan insurers to gain market clout to control costs. The chart shows the so-called Full Retirement Age (FRA), which is the age at which you’re entitled to your full monthly Social Security benefit, a pension based on your earnings history. Many boomers see their FRA as the time they ought to retire. But the question they should be asking themselves is: will the monthly benefit I’ll get at my FRA be enough? One thing has gotten lost in the turbulence around the fate of the Affordable Care Act (ACA): the health insurance provided by U.S. employers is relatively stable. 3 percent for family plans (to $18,764 for the average, combined premium for employers and employees) and 4 percent for single employees’ coverage in 2017 (to $6,690), according to the Henry J. Kaiser Family Foundation’s annual report on the employer health insurance market. 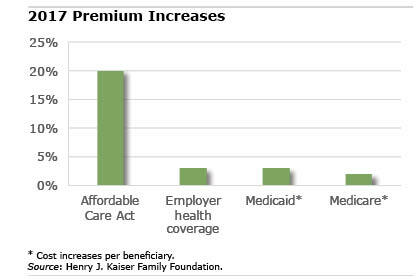 Employees enrolled in family plans pay under one-third of this total premium; single people, less than one-fifth. In contrast, there was a 20 percent spike in 2017 premiums paid by workers lacking employer health insurance who purchase their policies on the state ACA exchanges – and premiums are expected to increase sharply again in many cities in 2018. While the ACA’s system of mandates and subsidies has pushed the share of Americans covered to record highs, the new challenge clearly is to contain costs. “It’s really striking how much more stable the group market is than the far smaller marketplaces in the non-group market,” Drew Altman, the Kaiser Foundation’s president, said during a recent webinar. He compared the 20 percent increases and “very high deductibles” typical of ACA plans to modest premium increases and “no real deductible growth this year” for employer health plans. The rise last year in total employer plan premiums, although somewhat faster than inflation and wages, is an improvement over the 5 percent to 10 percent annual premium growth in the past decade. No obvious explanation exists for this relative stability, Altman said, especially at a time prescription drug costs are surging and health care providers are consolidating their market power. “I think it’s healthcare’s greatest mystery right now,” he said about the employer market.